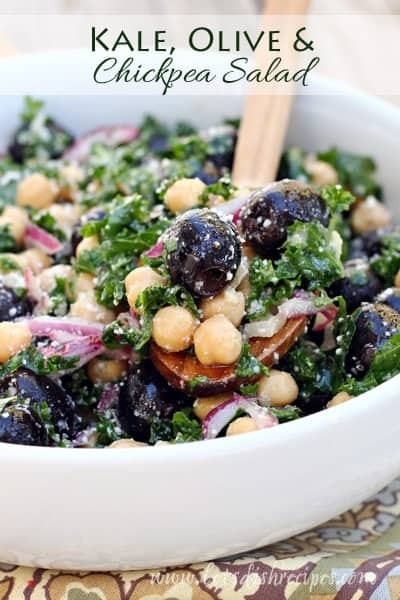 KALE, OLIVE AND CHICKPEA SALAD — Fresh kale, olives and chickpeas are tossed with a light vinaigrette in this protein packed, healthy salad. You’ve probably heard about the Mediterranean diet and how good it is for your health. The typical Mediterranean diet includes plenty of fruits and vegetables, whole grains, legumes and nuts. 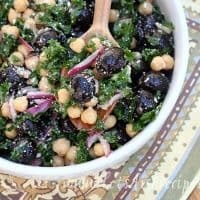 And this Kale, Olive and Chickpea Salad is one of my favorite ways to incorporate the Mediterranean diet into my routine. I should probably mention that my husband is a black olive fanatic! I keep several cans of California Ripe Olives in the pantry just for him. 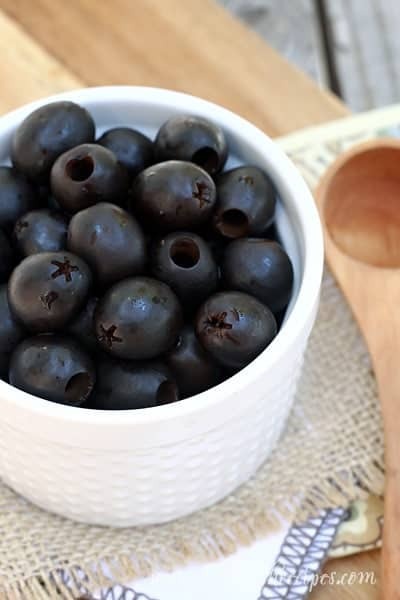 He’ll snack on them straight from the can, which is great, because a serving of olives contains 0 grams of trans fat, and they’re naturally a cholesterol-free food. Plus they contain vitamin E, iron, vitamin A, and fiber. And they’re packaged at their peak to preserve nutrients for year-round enjoyment. My favorite way to enjoy olives is in a healthy salad. 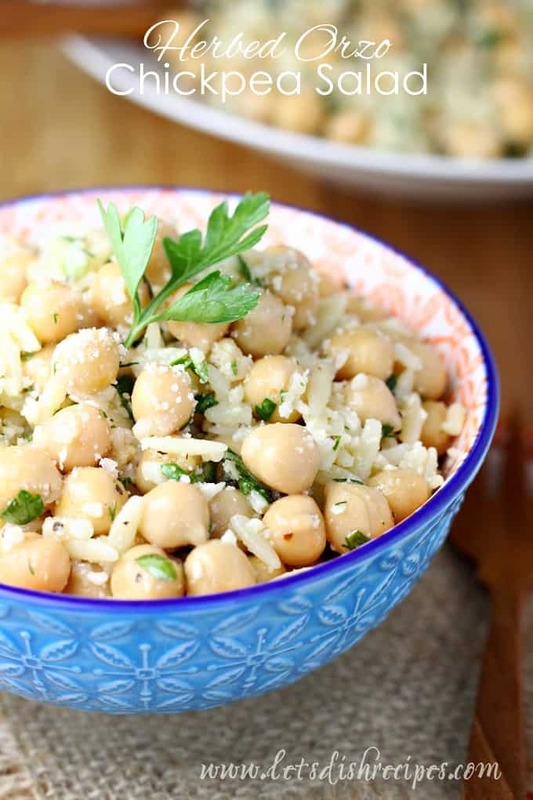 This Kale, Olive and Chickpea Salad is perfect for taking to the office for lunch. It also makes a great side dish, or even a light dinner on a hot summer day. And it only requires a few simple, healthy ingredients, and comes together in about 15 minutes. 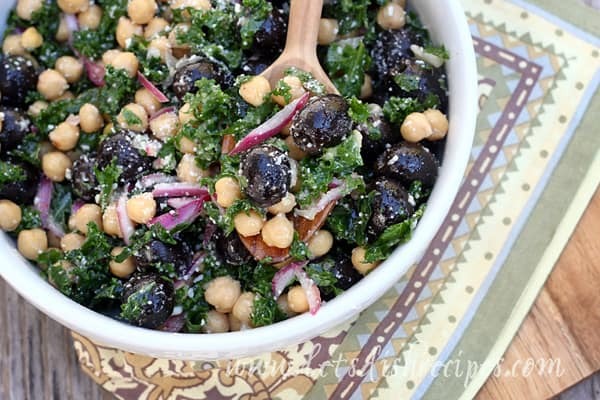 Once you have your kale chopped and your red onions sliced, all you have to do is stir in the olives and chickpeas and whip up a simple vinaigrette and you’re good to go! Slicing your olives, or cutting them in half is also an option, although I prefer to leave mine whole. Another important part of the Mediterranean diet is olive oil, so an olive oil and vinegar dressing is a great choice for this salad. I also like to add a bit of lemon juice, garlic and finely minced shallot. I usually finish my salad off with a sprinkling of grated Parmesan cheese, but that’s totally optional. If you have any toasted sunflower seeds or pepitas handy, they add a great crunch. If you make the salad ahead of time, wait until you’re ready to eat to add the dressing so everything stays fresh. 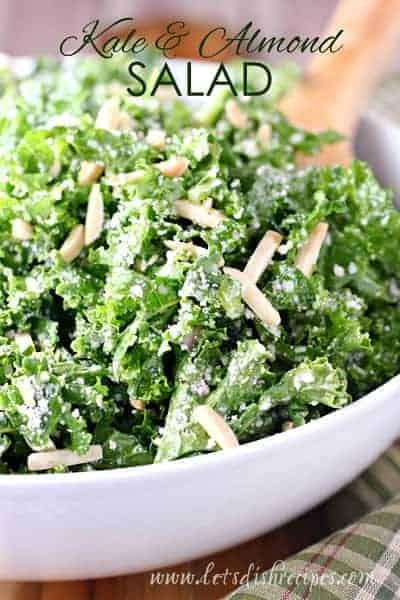 Be sure to save this Kale, Olive and Chickpea Salad recipe to your favorite Pinterest board for later. 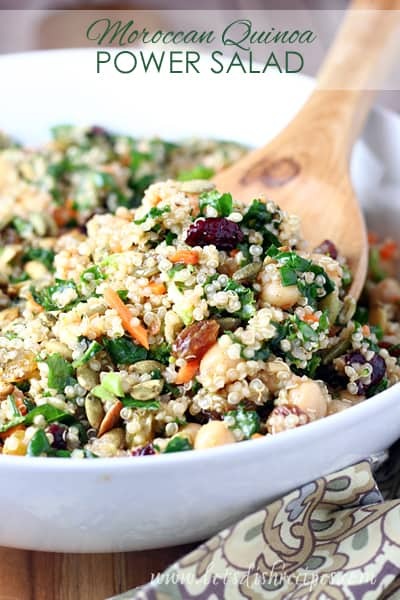 Fresh kale, olives and chickpeas are tossed with a light vinaigrette in this protein packed, healthy salad.